Rhoda Draws has developed this list to maximize your success at sketching quickly on location. These items are all you need to use her methods. Please leave other art supplies at home. ​Rhoda will provide a clear vinyl hands-free pouch for all supplies (except sketchbook) for $900 pesos; please request this supply kit unless you will provide each of these items yourself. ​- Aquarelle pencils (water soluble): about 8 colors: burnt sienna, olive green, indigo, red, purple, orange, teal, yellow ochre. Caran d’Ache Supracolor or Faber-Castell Albrecht Durer are best brands. ​- Rainbow pencil (not water-soluble), which produces different colors as you turn it. - Waterbrush with a hollow barrel (medium or large tip) to fill with water, used to liquify the pigment in aquarelle pencil strokes. - Uni-ball Signo white gel pen. Looks like a ball-point pen, used for opaque white lines on tinted paper or dark marks. 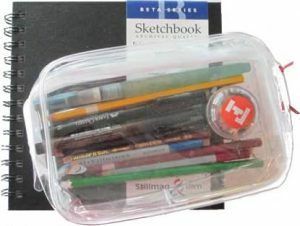 - Optional: Sketch book #2: Strathmore Toned (tan or gray) sketch paper, 5.5 x 8.5 (or similar, with tan or gray tint), view-finder, Prismacolor white pencil (NOT water-soluble) for tinted paper. ​- VERY useful for your comfort and safety: sun hat or visor, drinking water, sunscreen, a light-weight collapsible stool.